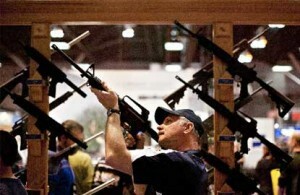 The Coming Depression: Is the gun business good for America’s economy? On the same day that Florida Gov. Rick Scott appointed a task force to review the controversial stand your ground law, the National Shooting Sports Foundation issued press release touting the beneficial link between guns and the economy. The release went on to say, “Firearms industry members were briefed on such remarkable statistics as the 30.6 percent increase in jobs between 2008 and 2011, a 66.5 percent increase in economic impact and a 66.5 percent increase in federal taxes paid by industry companies…. Some might argue that guns also can have a negative economic effect. Law enforcement to protect against armed criminals is a huge government expense, requiring higher taxes. Then there’s the cost of medical treatment associated with intentional and accidental injuries. There’s no doubt, however, that tens of millions of Americans buy guns or ammunition every year for self-protection and hunting. Hunting itself is a huge tourism boost. The NSSF report is here. What do you think? Is the gun business good for America’s economy? Leave a comment or click on the link below to take our poll.